How long, O Lord, will we forget? We all know the theory. That all scripture is inspired by God for teaching truth and for refuting error, so that we may be thoroughly equipped for every good work. Those of us from evangelical or non-conformist traditions place a very high emphasis on the supremacy of scripture. While most of scripture is basically God speaking his message to us, the Psalms by contrast are the very model of our imperfect message to him: of Christian worship, praise and intercession. But when we plan our routine weekly service patterns and when we debate our choices of hymnbooks and songbooks for our churches, is our uppermost thought how we can use scripture’s own such resource, the Psalms? What fraction of our churches today make a conscious effort to sing from the Psalms in some form, any form, in all their variety, on a planned, weekly basis? The typical local church in recent decades seems almost entirely to have let slip their systematic use: an alarming contradiction penetrating right to the heart of the life, worship and mission of our churches, which ought to worry us profoundly. Why are Psalms no longer regularly sung in today’s churches? Why do Christians, who love singing hymns and songs, so astonishingly fail to use scripture’s own provision? On those occasions when we do use the Psalms, is not our choice heavily biased towards the “nice” ones, those of obvious and overt praise and worship, the “triumphalistic tendency”? What about those of anguish and despair, which so naturally reflect our human condition? Despite our ideals of theology, our experience is often of the perceived absence of God, a dichotomy which the Psalms directly and realistically acknowledge and address. In the English language the texts of the Psalms, whatever the translation, are in irregular patterns. They do not marry well with any of the sorts of music we encounter day by day, whose patterns are almost always regular, whether baroque or hard rock, classical or country, symphony or soundtrack. The Psalms have come down through the ages to us in words-only form. We have no original music. But this is to our advantage: it gives us the opportunity to create a vehicle of direct relevance to our own expressions of praise, despair, frustration and worship. Yet still we try to be “churchy” even with these most human scriptures, the Psalms, wanting organists and chant forms which are respectively unavailable and culturally alien. When the pious-music bathwater has drained away, we find the Psalm baby has gone. How may the Psalms be recovered in our local churches? If we are to own the Psalms, we need to root their use firmly in our own cultures. For our western society we therefore need to consider versions of the texts and styles of music that are congruent to our own literature, poetry and theatre and even to magazines, television, cinema and video. If they are to be recovered as part of our regular, weekly pattern of gathered worship, we need to recognise and respond to their variety. This requires a large number of tunes. It would clearly be a Herculean and impractical task for a small congregation to learn an entire new setting each week, but it is vital that the typical congregation usually take some active part in the Psalm singing. Most of our churches today are quite small; their musical resources are limited. A responsorial form of psalm singing gives the congregation a short, highly singable and quickly teachable tune as a refrain. The singers and instrumentalists handle the more intricate work of the verses, learned in their regular practices. This form effectively employs the complementary strengths of each party. The settings given here are specifically intended for the modest resources of the small church, for the average church pianist, organist or guitarist and a singer leading the congregation. Of course much larger resources may be used if available. They are unashamedly biased towards music-group rather than organ and four-part choir. That said, most can be adapted to many styles to suit local resources. David Lee (b. 1956) was brought up in Didsbury, Manchester, and sketched his first hymn-tune while at primary school. He has been active in church music since his early teens, accompanying the local Crusader (now “Urban Saints”) youth group, and playing the piano and organ at All Hallows Church, Cheadle, Cheshire. During summer months in 1975 and 1976, he was Abbey Musician at Iona Abbey, which provided a sharp contrast to, and widened outlook from, his earlier largely conservative-evangelical background. …In 1995 the family settled at St. John’s Church, Nevilles Cross, Durham, where these strands and ideas of writing were actively encouraged and began weaving together. In particular these included recovering the psalms (which, worryingly, are almost entirely lost to corporate evangelical and charismatic worship) in ways sympathetic to music-groups and small churches, but still teachable with minimal liturgical intrusion, week by week. In 1998, he was invited to present a paper Top-down or bottom-up: restoring the balance to the World Church Music Symposium in London, pleading for a recognition of the importance both of the “small church” and also of a range of music for all churches. Following that, he was invited to join the Durham Diocesan Liturgical Committee music subgroup (and the local RSCM education group) where he is fostering a short course to give “small church” musicians a basic confidence-building grounding in music for worship. David is a member of the Hymn Society of Great Britain and Ireland, and from 2007 is serving on its executive committee. He was also an early encourager of the Christian Songwriting Organisation email group. Various periodicals (e.g. Deo magazine, Stainer & Bell’s Worship Live and MWF’s Sing a New Song) take some of his settings from time to time. Recent entries in the St. Paul’s Cathedral Millennium Hymn Competition and RSCM competitions have been highly placed. More formally, he has had tunes published in Stainer & Bell’s Sound Bytes and was among the major contributors to the Methodist Wesley Music for the Millennium project. In 2006, the Lutheran Church Missouri Synod published his new tune Elvet Banks in their new hymnal. In 2011 the Methodist Church published four tunes of his tunes in the new Singing the Faith hymn book and in 2012 the combined Christian Reformed Church in North America (CRCNA) and Reformed Church in America (RCA) published seven tunes in their Psalms for All Seasons: A Complete Psalter for Worship . my Oratorio-with-a-Difference, Prayerbook. It features a Calypso sung by the Choristers of New College Oxford, and a comedy Fugue sung by the top Barber-Shop Quartet Over-the-Bridge, to words from the back of the Church of England’s Book of Common Prayer about who you’re not allowed to marry, beginning ‘A man may not marry his grandfather’s wife’. The Waynflete Singers, one of the best choirs in the country, will be accompanied by glittering brass and percussion, by the mighty Romsey organ, and by the prize-winning Navarra String Quartet. The international operatic baritone Peter Savidge is the soloist. The piece has its serious moments too, of course – it begins with a thought-provoking phrase from 1549: ‘There was never any thing by the wit of man so well devised, or so sure established, which in continuance of time hath not been corrupted’. At which point the chorus Hisses – the first time this effect has been used. 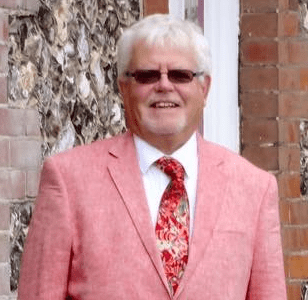 Second things second – is it possible you do not already know of David Owen Norris? Born in 1953, he studied music at Keble College, Oxford where he was organ scholar; he is now an Honorary Fellow of the college After leaving Oxford, he studied composition, and worked at the Royal Opera House as a repetiteur. As a pianist, he has accompanied soloists such as Dame Janet Baker, Larry Adler and John Tomlinson , and his solo career has included appearances at the Proms and performances with the Chicago Symphony Orchestra and Detroit Symphony Orchestra. He has also presented several radio series (his Playlist Series for BBC Radio 4 has recently finished its second series). He has also presented for television, and appeared in a number of television documentaries. He is a professor at the Royal College of Music and also teaches at the University of Southampton, where he is Head of Keyboard.He has also been Gresham Professor of Music and a professor at the Royal Academy of Music (having earlier been a student there). You can read about his career in more detail on his website here. I first had the privilege of meeting David Owen Norris in 2010 when the Lay Worship Leaders of Andover Deanery united to offer a service of our joint devising on St Swithun’s Day, 15th July. David, who lives in the area of the Deanery, kindly agreed to be our Music Director. With exquisite skill, he turned the offerings of a local hymn writer into something that scanned and had real meaning and jollied us all -possessed of only accidental musical talent, if at all, into a team (in other words, he directed much more than the music). ‘Let nought but the green grass cover the grave of Jahanara, For grass is the fittest covering for the tomb of the lowly’. I think great hymns are as much works of art as Shakespeare’s Sonnets – and we wouldn’t ‘improve’ them, or tweak them to fit our own preferences. I hope very much you will be able to join us in Romsey Abbey. But if an immoveable physical object such as the Atlantic Ocean makes your presence unlikely, then I urge you to read more about the work on David’s website. …Of particular interest is the suggestion that clergy, lay readers and all relevant musicians should actually meet to discuss the liturgy and theme for a service, then try to match the music to it. I’ve been to a number of meetings like that, and they can work. It’s rather sad that there is such a clash of egos in so many places that prevents systems like this from working. Perhaps the best way forward is simply to talk more often in a bid to gain mutual trust and respect – with or without full-blown meetings. And if that can’t be arranged, then really, the question should be asked as to whether the organist is right for that church – with or without the desperate shortage of organists at the moment. The Revd Jonathan Hagger may call himself mad, but he knows a hawk from a handsaw and (despite his tease) a tart from a Tartar. Maybe he is ‘but mad north-north-west: when the wind is southerly’ he seems to me to have the wisdom of Solomon himself. As I read Kathryn Rose’s beautifully expressed piece on the point of view of the organist, I saw my own problems with ‘Drisella‘ in quite a different light. She may have been a tiresome woman (she was) but I do begin to see the situation from her standpoint. Our not-so-mad priest identified in the comments on Kathryn Rose’s post that the problem was chiefly one of communication, together with a little good will. … the ideal way to plan the music of a church is for the worship leader, organist (or whatever) and, if there is one, the leader of the choir, to come together to decide on the hymns. The worship leader is usually word orientated and meeting together allows a greater number of hymn texts to be used because the musicians will be able to suggest tunes that they and the congregation know when the set tune for a hymn is unknown or just plain bad. At these meetings the worship leader can explain the theme he or she wants to dominate the service (which may be different to the recommended theme). Then I believe it to be good manners for the worship leader to allow the musicians to choose any anthems etc…Both worship leaders and musicians must never lose sight of the fact that they are doing it for the congregation which, if they are not pleased, will not bother turning up again. This dollop of common sense needs to be circulated to every parish church in the land, in my opinion. Of course, knowing what the answer is is not the same as being able to apply it. But it is a start. Note by Laura Sykes, Lay Anglicana. In response to my post called ‘Can Lay Worship Leaders and Organists Make Music Together‘ I invited the organist, Kathryn Rose, to submit her reactions in the form of a guest post on this blog. She too has a blog, The Artsy Honker. I am an organist. I think I have a good working relationship with my vicar. For our choir, as well as for my organ-playing skills, it would be inappropriate and unrealistic to choose music on a week-by-week basis depending on what the vicar has decided to preach on. I draw up a music list a month in advance and send it to the vicar, we have a chat about what is required and debate whether there need to be changes. That certainly diminishes any sense of being a human juke-box. I’ve been given a great deal of freedom in some areas, but I remain conscious that the incumbent really does have the last word. I bear in mind that this also means he bears any responsibility for things which turn out to be grossly inappropriate! I’m new to this parish as well as to the instrument and I do value the vicar’s advice as well as acknowledging his legal position as the one with whom the buck must stop. In turn he recognises that I have far more musical training and experience than he has (even if I am relatively new to playing the organ) and does not ask for the impossible or disparage my musical ideas, and that goes a long way toward me being happy to be flexible on some things. I try to be generous, and so does he, and it seems to work out. I am fortunate in that the vicar does have musical taste that is similar enough to mine that I am not often asked to play something I loathe, and that we understand each other fairly well in theological terms. I am sure that in a parish with a very evangelical worship style I would be deeply unhappy! Context is very important. Similarly, in some contexts it might be appropriate for the minister to choose hymns the day before, based on the sermon — though I suspect that is rare and that in many places where this is routinely done the quality of the liturgy suffers because the musicians have not had adequate preparation time. I think a lot of friction between ministers and organists is due to unrealistic expectations on either side, not recognising the reality of the resources available or the needs of the congregation. For me, this is a labour of love, and a ministry. I am doing work that is liturgically important, theologically important, having had no formal theological training. I am responsible, to a degree, for pastoral leadership of the choir though I have no formal pastoral training. My musical training (which started in childhood) was not paid for by the good old C of E the way most ordained ministers’ theological training is, my work as an organist prevents me taking more lucrative work elsewhere, both because of the specific times and because of the ten to twenty hours per week I put into parish work. I am paid on a per service basis for playing, but it is very much an honorarium, and my impression is that this is the case in most parish churches. There are many places where the organist comes in and “makes a fist of it” while working a full-time day job (and in some cases this is appropriate — again, context is everything! ), but that doesn’t really change the fact that there are a good number of organists for whom this work is a vocation, not a job, and who apply considerable professional and personal resources to serving God through leading the choir and congregation in musical aspects of worship. So, being an organist can be a ministry, and it can be a lonely one. I am blessed to have a good working relationship with my vicar, but I know there are ministers who somehow cannot take an organist’s ministry seriously. The congregation I work with is mostly supportive — there will always, always be people who complain about any music they “don’t know”, but I also get positive feedback, which helps a lot. Sadly that is not the case everywhere. The choir are small but mighty and they are absolutely wonderful in terms of trusting my leadership and encouraging one another, which is absolutely crucial as most of them do not read music at all; I have known of choirs which undermine rather than support their organists, or situations where someone in the choir will try to play the vicar and organist off against one another. I can easily see how in a less supportive situation it would be easy for an organist to feel taken for granted, or to feel that the others involved in leading worship simply do not care about the liturgy. That’s a heavy burden for anyone. 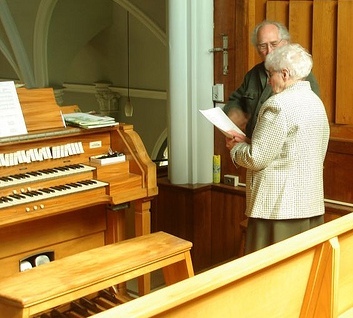 The church provides little or no support for organists, the RSCM provides some training but without a supportive church it can be unaffordable and it is always fairly technically focused (which is great, but offers little recourse for an organist who feels undervalued). Organists are likely to get frustrated, bitter and controlling in such situations, and though some can be particularly difficult I would encourage anyone with “organist trouble” to take a step back and look at what systemic factors may be contributing to such distress. In the case of an organist who has outlasted several clergy this may be very difficult to determine but I think it is worth an honest effort. Perhaps the reason we manage as well as we do at St Andrew’s is the deeply held conviction that indeed there can be only one star at church, and that is not me, or the vicar, or a visiting priest or preacher, but God. If that is forgotten then I respectfully submit that a parish may have much worse problems than organist trouble. Can Lay Worship Leaders and Organists Make Music Together? 2. Where there is an organist, choirmaster or director of music the minister shall pay due heed to his advice and assistance in the choosing of chants, hymns, anthems, and other settings, and in the ordering of the music of the church; but at all times the final responsibility and decision in these matters rests with the minister. 3. It is the duty of the minister to ensure that only such chants, hymns, anthems, and other settings are chosen as are appropriate, both the words and the music, to the solemn act of worship and prayer in the House of God as well as to the congregation assembled for that purpose…. There is something in the make-up of clergy and organists which on occasion impels them to behave both irresponsibly and irrationally. Obvious to all are the repercussions of two apparently responsible adults, both in prominent parochial positions, being unable to see eye to eye. Much harm can be done to the cause of the Church by the inevitable tongue wagging which accompanies such incidents. At the same time, members of both professions normally enjoy being centre-stage and have a flair for performance — and in churches, as in any other theatre, there can generally be only one star. “The minister must not treat the organist as a human jukebox, and the organist must recognise that the minister has final authority in matters of worship,” Mr Leach says. 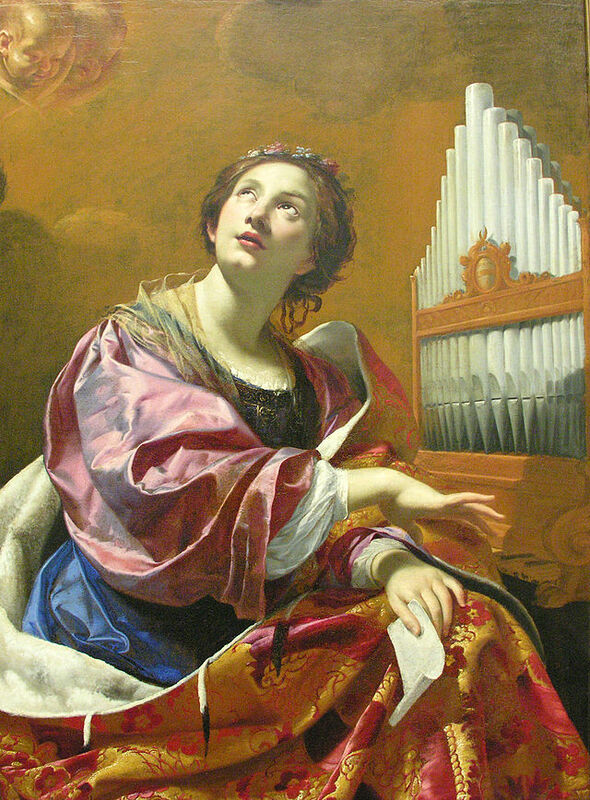 In our illustration, St Cecilia looks as if butter wouldn’t melt in her mouth, but she also looks as if she were taking her instructions direct from the Almighty: if it takes a brave incumbent to intervene in this cosy conversation, for a lay worship leader to do so is brinkmanship of a very high order. The first organist I encountered on becoming a Lay Worship Leader was called, shall we say, ‘Drisella’. (The alias is necessary to protect the -possibly litigious- guilty). She had seen off many priests in her time, and presumably anticipated I would present no problem. A month in advance, I emailed Drisella (very politely) with my choice of hymns for the service I was due to take. The reply was instant, and deadly. She would make her choice, based on the theme and hymns suggested in the Royal School of Church Music’s ‘Sunday by Sunday’ booklet. She then refused to play at any service taken by me. Luckily, at that point my dear husband (and churchwarden) intervened. Although the last time he had played the organ had been in Dacca Cathedral in 1971, he would fill the gap. And so he did, for the next three years, the lovely man. At that point, a new priest-in-charge arrived: to the relief of all, Drisella did not survive the initial conversation about their future relationship. We moved to a rota system, whereby a series of local organists took on, say, ‘the third Sunday of the month’. There was no ‘Prima Donna’, only a foursome who took it in turns to play in various benefices in the deanery. All that was needed was a little good will, with no jockeying for position. Harmony was restored. All for the greater glory of God. Amen. 1. 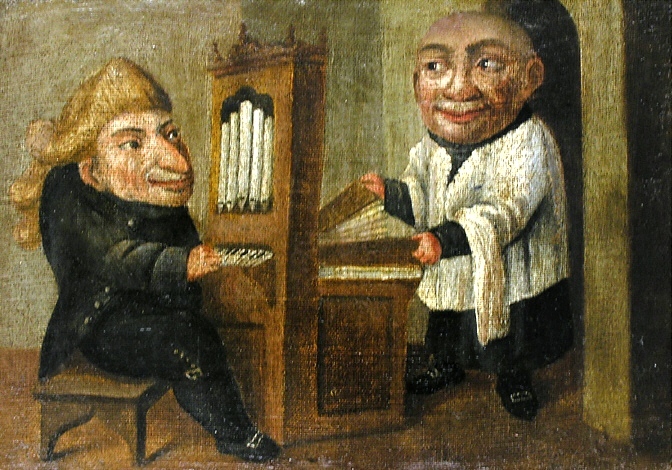 The main illustration is ‘Organist und mesner’ by an anonymous Italian painter, 18th c via wikimedia. ‘Mesner’ = sacristan. The two seem to be to be eyeing each other distinctly warily. 2. The second illustration is ‘Saint Cecilia’ by Simon Vouet c. 1626 via wikimedia. 3. You can read Ruth Gledhill’s story in full if you click the hyperlink, as it was written before the pay wall. 4. Kathryn Rose, of the Artsy Honker blog, has been invited to post with her reactions at The Organist’s View.